Smart Home Blog » New version of iRidium Mobile is out! New version of iRidium Mobile is out! supporting of controllers powered by ModBus TCP and AXICO protocols! It opens the opportunity for installers of building home automation systems based on low-priced and fail-safe ModBus TCP controllers such as Beckhoff, Siemens, Wago, Schneider Electric and many others. These reliable controllers have been seldom used in home automation due to the absence of comfortable display facilities. With the release of iRidium 1.2 and our GUI editor iRidium GUI (scheduled for release in late october) the controllers powered by ModBus turn into complete alternative to the systems like AMX, EIB, and C-bus. possibility to see a streaming video from web and IP cams! Now iRidium can get a view from any camera all over the world, and 3G network makes possible to achieve pretty good quality at the speed of 7-15 FPS! choice between outer and inner connection on iPhone! This feature was added upon request of our partners for their customers’ comfort. If inner or outer IP connection isn’t set on default, the application suggests these two possible ways of connection. 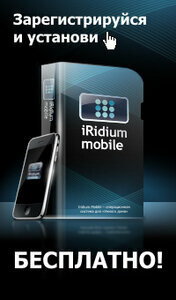 The iRidium Mobile 1.2 can be downloaded here. Control of EIB/KNX systems via KNX IP-Router. iRidium CustomDriver – the configurable driver allows iRidium to support practically any equipment used in home automation. Support of Shturman equipment (shturman.net). And the finally. If you’d like to meet iRidium developers you may do it on the HI-TECH BUILDING 2009 which will take a place in Moscow on December 8 – 10, 2009. Iridium can be downloaded for free!